All properties are comfortably furnished and stylishly decorated with a mix of new and vintage furniture. Each property has a fully equipped kitchen with dishwasher, oven, fridge (with ice box). The 2 larger gites have washing machines and guests in the 1 bedroom gite have access to a washing machine in the adjacent bread oven. All Bed linen and towels are provided (guests are asked to provide their own pool towels). All properties have private terraces with barbeques and comfortable outdoor furniture, including parasols. A cot and highchair are available by request. Changeover day is Saturday in high season. At other times we can be more flexible so please ask. The 12m x 5m pool in front of the properties has open 360 views and fully fenced in accordance with French law making it safe for small children. The pool open May to Sept (inclusive) and is heated to 27C. On the south side of the pool there are sun loungers and a pergola and parasols provide shade plus tables and chairs for games and snacks. Guests are free to roam the 3 acre grounds which are home to a variety of wildlife. The properties can be rented individually or as a whole, ideal for multi-generational families or groups of friends. We are David and Amanda Travis and in the past spent many holidays in France with our children and friends staying in privately owned gites. We had some very good and some not so good experiences!! As a result we were inspired to set up our own gites and Les Charmes has been receiving guests since 2006. We finally fulfilled our ambition to move to France in 2012 and now live here permanently. We have always loved the Dordogne for it's pace of life; cuisine, wine and stunning countryside. 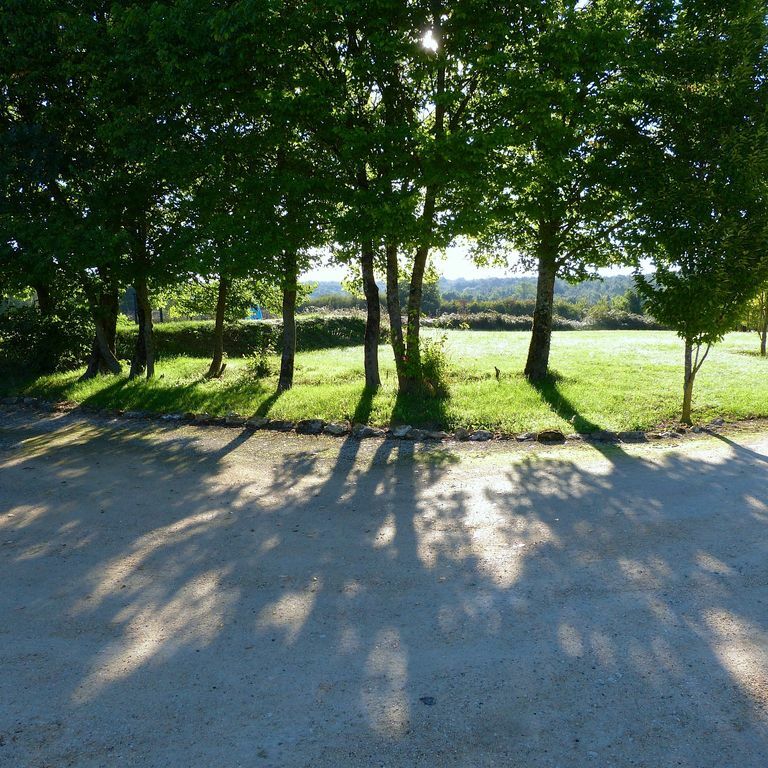 Our property is off the beaten track and the sense of quiet is truly remarkable yet we are only 10 minutes drive from two local towns and about half an hour away from Bergerac airport. The properties are stone built and around 200 years old and we thoroughly enjoyed the renovation project which has brought the properties back to life after they were abandoned some 50 year earlier. We are conveniently located for all the major sites of the Dordogne and having a heated swimming pool really fulfills the one luxury that was always at the top of our list. As ours was a renovation project we basically started with empty shells - which has allowed us to plan the layout to make best use of space whilst retaining many original features. We have also made sure that the properties are equipped to the standard we would expect which means a full range of kitchen appliances, good quality knives and pans and above all a corkscrew! There is a range of cookware, crockery and cutler, including a slow-cooker. There is an excellent golf course at Chateau Vigiers on the edge of Bergerac approx 18 miles away. Notes on accommodation: The property is very secluded and quiet making it a great place for children to run around in and the property is generally child friendly with cots, highchairs and night lights available. A selection of indoor and outdoor games are provided and a small library of books is available in each property. Outside of high season heating, if it is required, is by electric radiators and/or the woodburning stoves. Outside: Each property has a terrace with barbeque and patio furniture. These are arranged to ensure that each is not overlooked from the other properties and all have lovely views. The capacity of the outside furniture is at least the same as the interior dining furniture. The larger than average saline 12m x 5m swimming pool, with its terracing, (fully compliant with French safety legislation), is situated in front of the properties in full sun all day It is heated to 27C allowing use in mid season. Sun loungers and seating are provided and there is a Pergola for shade. The 3 acre grounds were farmland but there are mature trees for shade. We are surrounded by farmland and ringed by woodland and we are privileged to get regular visits from the local wildlife, including the deer who will come very close into the building on occasions, we also have resident hares and many species of birds, red squirrels are common. Les Ronces was everything we hoped for. Very quiet, very dark at night, gorgeous stars. Everything worked, we cooked most nights, the British Television was smashing. The pool was perfect as the weather was warm and we were beat after daily exploring. Mandy was a terrific hostess and made our say extra special with her local knowledge. The area is chock full of things to see. Bergerac, Perigeaux, Beaumont ( you gotta visit their hardware store), and don't miss Monpazier a real gem of a very old French village. Comfortable apartment with swimming pool which enabled us to cope with the 36C a shortage of shade made for a struggle to get out of the sun in the evenings. A great place to relax but still plenty to do. David and Amanda are great hosts - friendly and helpful. The Gite is well laid out with lovely grounds and a great swimming pool. So many interesting places to visit without having to travel far. A perfect antidote - highly recommended! David and Mandy have a perfect idyll; their little pocket of perfection is a perfect antidote to everyday life! Splendid views, peace and quiet and the 2-person gite we stayed in was the perfect size for us; so cosy and clean and well-equipped. David and Mandy were super hosts; there if needed and full of great tips and advice on French life and the surrounding area. Very highly recommended. A beautiful gite perfect for two people. We loved our stay at Les Ronces. The gite was very pretty and had everything we needed for a delightful stay. We were out most of the day sorting out our own property but loved coming back to the gite for a nice hot shower and evening meal. David and Mandy were very friendly and hospitable and generous in their advice and help. Peaceful and beautiful but within easy travelling of many towns, villages and attractions. Driving: from the channel port of Calais it is about an 9 hour drive. Bordeaux Airport is around 1hr 45mins drive. As we are a rural property a car is essential. Les Charmes lies between the Bastide towns of Monpazier 6km ("plus beaux villages de France") and Beaumont 7km. Beaumont has a bank, post office, tourist information centre and a good selection of bars, restaurants and shops including a supermarket open on Sunday mornings. It also has a weekly night market with live music and open air dining and bars - a great night out for all ages. The area is rich in history and many local attractions and activities reflect both the history and culture of the area. You can sample the local specialties of Walnuts, plums, prunes, foie gras and especially "Cepes". In Sept Monpazier hosts its world famous nightly Cepe market. with a ncycling (bikes can be hired in advance of your holiday via our website), horse-riding is available close to Beaumont, you can go canoeing on the Dordogne or fishing in the many local rivers – a “carte de peche de tourisme” is required. • Sarlat – one of the Dordogne's prettiest and most famous towns. • La Roque Cageac – which hangs onto the cliff side of the Dordogne valley. • Les Eyzies-de-Tayac - with the national museum of pre-history. • The caves of Lascaux – with the world famous cave paintings. • Chateau Monbazillac – where you can taste dessert wines to rival the best Sauternes. • St. Emillion – a beautiful village and home to some of the worlds best red wines. • Cahors – with its imposing medieval architecture. • Bordeaux – the regional city with its beautiful old town. Booking Notes: Bookings can be made either by contacting the owners by telephone or using the owners website, where full terms and conditions can be found. A deposit of 25% is required to confirm a booking, the full balance is due 8 weeks before arrival. A security deposit of at least £100 per property is required. Changeover Day: Preferred changeover day is Saturday during high season, outside of this we may be able to be more flexible so please enquire. Access to the properties is from 4pm, and departure is 10am unless otherwise agreed. Notes on prices: Prices are per property per week and include all bedding & linen (except pool towels and cot linen) and cleaning. For bookings of 2 weeks a second linen change is included in the price. Additional cleaning can be arranged locally. Out of season a surcharge for electricity and wood may be applicable.